March 14 every year is a special day for me. In North America, it’s “pi day” (3.13…. 3/14… get it?) I was going to celebrate with some actual pie, but my fasting blood sugar levels suggested that that’s not the wisest move, so I reneged. Today, it’s also a sad day, due to the passing of Dr Stephen Hawking. When I was a young physics student, Hawking fascinated me (as he did everyone else) for so many reasons. His debilitating disease gave him an air of specialness that, thankfully, was well correlated with his intellectual heft. Back in the 1980s, before he was equipped with the voice modulating equipment that allowed him to have synthesized speech, it was his senior graduate students who would translate his whisperings during public lectures. That led a few observers to speculate that it was the students, not Hawking, who were the true visionaries. One of my very few memories of my undergraduate education is when I wrote an essay about the mythic architecture of Hawking’s life, how he was more wizard that scientist. My professor was not impressed. While I mourn today, I also celebrate it, because today would have been Albert Einstein’s 139th birthday. One of the reasons I am eager to celebrate Einstein is that he is one of the few historical figures that 100% of people agree is someone to be valued. He has escaped “crabs in the bucket” effect of today’s social discourse. You know, our tendency to drag down anyone who shows excellence and who is not 100% in agreement with all of our individual values. With my current cynical mood about the world and my fatigue with identity politics in particular, I was tempted to begin this blog post by saying: Today we celebrate yet another rich old cis-hetero white male Israel-supporter who cheated on his wife, just to be ironic. 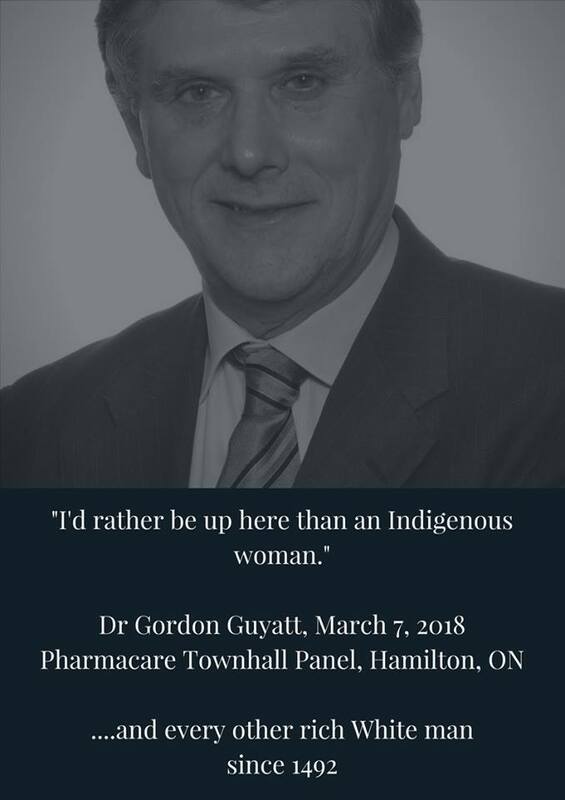 Pardon my sensitivity to this, but it comes on the heels of a recent appearance by Dr Gordon Guyatt at a panel discussion in Hamilton, Ontario, regarding a potential national pharmacare program. Guyatt is a legendary figure in Canadian medical history and one of our nation’s most cited medical scientists (the 14th most cited scientist in the world, according to Google). He has progressive politics, is the son of an Auschwitz survivor, and twice ran for public office as a representative of the NDP, Canada’s socialist party. During the event, a questioner asked why the panel did not include representatives from marginalized groups, such as indigenous women (a standard question now at such events). The moderator answered that such individuals were invited but did not attend. Guyatt then offered what sounds like, “I’m grateful to be up here instead of an indigenous woman.” (A video of the exchange can be seen in the comments of this public Facebook post). I take his response in two possible ways: (1) he acknowledges that indigenous women’s lives are hard, and he’s grateful not to have that hard life; or (2) since an indigenous woman could not be found for the panel, he is grateful that he was able to fill the role. Really? Does it really make sense that Gordon Guyatt, a man who has dedicated his life and career to helping others, would be so callous? Or does his comment make more sense in one of the two ways I’ve suggested above? And of course now the Canadian Labour Congress has got involved. How is Guyatt’s verbal clumsiness rewarded with a campaign to force an apology, while Khogali’s naked threats rewarded with an actual city award? Anyway, I’m at my wit’s end with this stuff. And remember, I’m an immigrant person of colour who comes from poverty. It’s not like I’m not unaware of the problems with traditionally white mainstream institutions. But that’s not an excuse to vilify any particular individual because of a clear verbal stumble. If you’re interested in hearing more from Gordon Guyatt, our epidemiology society conducted an audio interview with him here. But today’s post wasn’t supposed to be about Gordon Guyatt. It was supposed to be about Albert Einstein…. that other old white, cis, hetero, Jewish scientist. I have no doubt that if Einstein were alive today, he would be characterised as a Zionist and possibly guilty of “sexual misconduct”, given his infidelities, poor treatment of his first wife, and the fact that his second wife was also his first cousin. And so I am so unspeakably grateful that he lived in another era, and that we can all celebrate his gifts to civilization without the tarring effects of modern identity politics. 1905 was arguably Einstein’s greatest year, the so-called Annus Mirabilis or “miracle year.” In that year, he published four papers (a pretty good output for any scholar), each of which history now concedes would be worthy of a Nobel Prize in and of itself. And he did it all at the age of 26. One of the papers was titled (in German) “On the Electrodynamics of Moving Bodies”, hence the title of this post, and described his Special Theory of Relativity. The General Theory would come some years later, and the two would describe perhaps the greatest intellectual achievement in the history of theoretical physics. On the birthday of Einstein and the deathday of Hawking, I relate a story, one that I like to tell non-scientists to get them interested in astrophysics. It is about the intellectual battle between Leonard Susskind and Stephen Hawking. In the early 70s, Hawking showed that Black Holes should slowly radiate energy (Hawking radiation) as matter irretrievably disappears down its gullet, which is in violation of the most holy of precepts in physics: the Conservation of Information. Susskind and others took offence, leading to the “Black Hole War”, which was a series of snarky debates between the two camps. 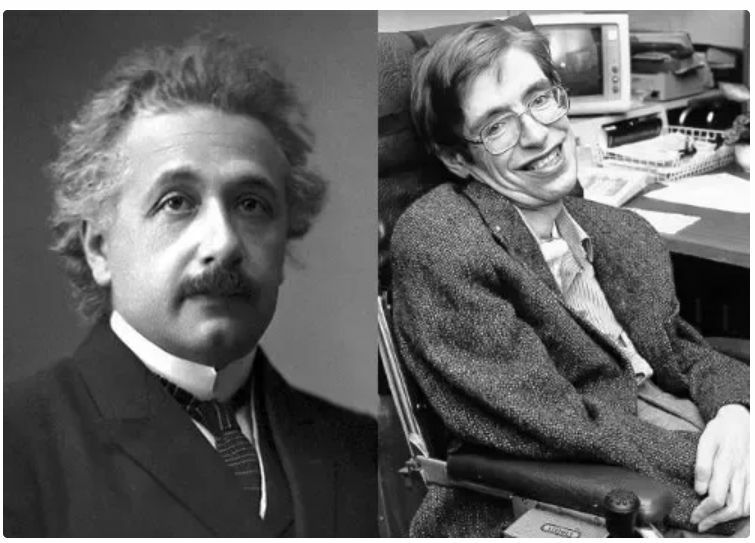 Hawking eventually admitted defeat, as the Physics world accepted Susskind’s and Gerard ‘t Hooft’s “Holographic Principle” in the 90s as a solution that allows both Hawking Radiation and Conservation of Information. But the principle, now widely accepted, also opens the door to some true mindfuckery, including the strong possibility that our universe is like a hologram, with true reality being experienced somewhere beyond the edge of all existence. On Einstein’s birthday, the second story I will relate, that most people don’t know about, is about Albert’s role as a hostage negotiator. 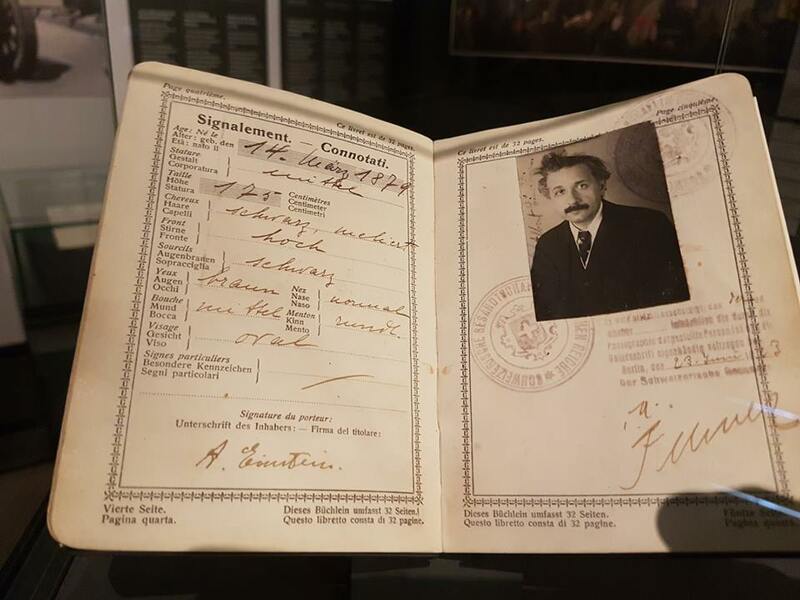 (And below is a picture I took of his passport when we visited his boyhood home in Switzerland last year). While he was at the University of Berlin, radical students took the rector and several professors HOSTAGE until their demands were met. Einstein and Max Born (another future Nobel laureate) were the ones who negotiated the hostages’ release. The third little-known story I will relate on Einstein’s birthday is lascivious. Did you know that Einstein had an illegitimate daughter named Lieserl, who was born to his future wife before they were married? Here’s the kicker…. to this day no one knows what became of Lieserl. She disappears from history shortly after her birth. That is all for today, dear reader. If you are as obsessed with the life of Einstein as I am, you might enjoy this excellent little movie called Einstein and Eddington, which looks to be available on Youtube…. quick, before they figure it out!